Systems engineering is an interdisciplinary field of engineering that takes a whole-of-system view of a problem and its solution. The operational domain model is a central part of any model-based approach and describes the system in the context of its environment. This includes the humans that are intended to operate and interact with the system, external objects that might influence the system, and environmental elements that could impact the system. The operational domain model is a useful starting point to get an overview of a system and how it will operate. Enterprise Architect provides a range of features that help the engineer to construct an operational domain model, including standard SysML Block definition and Internal Block diagrams, and the ability to include pictorial representations of elements that make the diagrams more compelling. The elements can also be hyper-linked, enabling the viewer to use a diagram as a launching pad to more detailed models and diagrams. The SysML Operational Domain Model defines the system's operating environment, which describes the operating conditions that the system is intended to operate within. 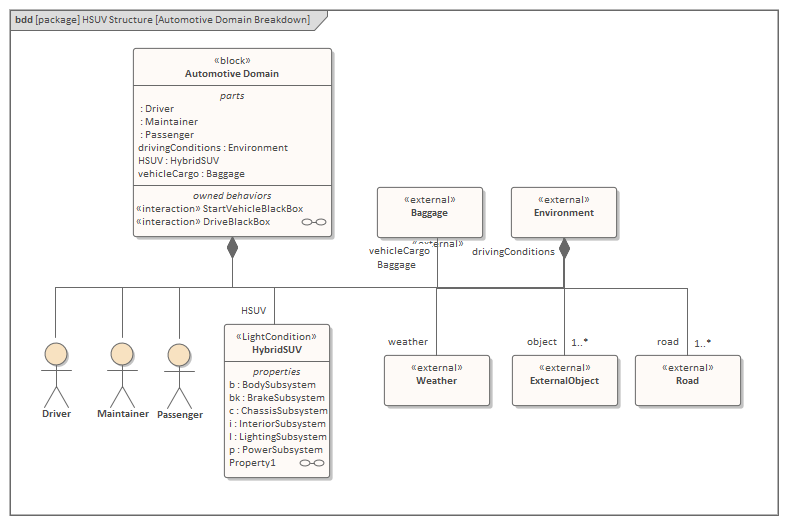 This diagram shows an example Operational Domain model for a Hybrid Sport Utility Vehicle; the SysML Block Definition diagram describes the Operational Domain (in this example - the Automotive Domain) as a system composition. In the example, the Automotive Domain is defined as a system containing other subsystems; the domain contains subsystems that define the Driver (that is, User), the Hybrid SUV, Baggage (which is carried in the vehicle), and the External Environment. In the example, the Automotive Domain system's detailed composition shows how the Hybrid SUV and other subsystems fit together to form the Automotive Domain; it also describes the binding relationships between the parts, which define how the parts are functionally bound to one another.